Welcome aboard, let us take you to the fascinating Moreton Bay Marine Park! Here you will find Bottlenose dolphins playing and Dugongs feeding amongst the giant Loggerhead turtles. Our onboard marine naturalist will entertain you with in-depth knowledge about our diverse underwater world and the interesting history of the Moreton Bay Islands. For over 10 years our crew have been dedicated to providing the most intimate marine encounters possible, ensuring you have an exciting and memorable day! Our modern, specifically designed wildlife friendly vessels have 3 large viewing decks meaning all our guests get a front row experience on this ultimate Marine Discovery Tour. Relax and enjoy our exciting cruise through the clear shallow waters of Moreton Bay where wildlife is plentiful and our onboard marine naturalist guide will tell you everything you want to know about this pristine environment. Experience snorkelling the 15 Tangalooma Wrecks and discover the variety of hard and soft corals, over 250 species of sub-tropical fish, active seabirds and a chance to swim alongside a sea turtle! Let the solo adventure begin! 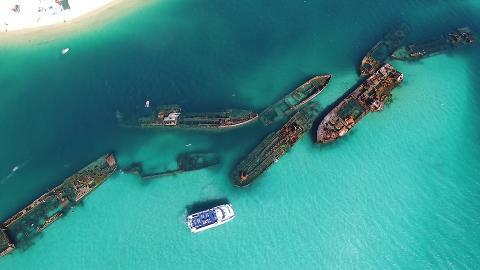 Explore Moreton Island by wandering the white sand beaches, climb it's famous sand dunes, cool of with a swim or simply take in the scenery from the sundeck. Experience the explosion of colour and movement when we hand feed the local reef fish! Enjoy a delicious tropical lunch featuring fresh prawns, chicken and a selection of salads on board. Avoid the stress of directions and parking by using our simple transfer service. We will pick you up from our designated pick up point located in Brisbane's CBD. This is located outside the Roma Street Railway Station (Brisbane Transit Centre), directly opposite the Queensland Police building.